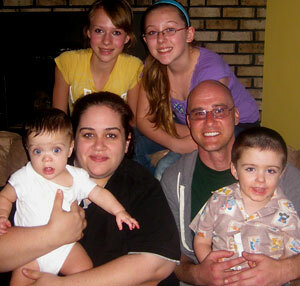 This month we’re helping Jeff and Becca from Indianapolis prepare to bring their new triplets home from the hospital. All three were born very underweight and are currently in Neonatal ICU, but are doing well and will be coming home soon. With four children already, adding a surprise batch of triplets is going to put considerable financial strain on the family, and that’s where we come in! Let’s help give them everything they need to welcome the triplets home, including diapers, food, furniture, gift cards – any cool baby stuff you can think of. We’re shooting for at least $3,000 in cash, plus gifts. Let’s do this! We’re going to direct everything we raise this month toward taking care of these new babies. Jeff and Becca live in a very small trailer home that’s already quite full with four other children. Now with a total of seven kids, it’s a lot to handle all at once. Diapers alone are going to run hundreds of dollars per month! Let’s give them a big supply of those, along with a ton of other baby stuff. Even though these two don’t have much, they still give back as a family. Becca will often cook extra food for dinner and invite over other kids from the neighborhood to help feed them when they don’t have enough to eat. It’s a tough time financially for Jeff and Becca right now, and many of us have been there before . . . uncertain about our children’s future, let alone our own. But now that we’ve made it through, it’s a great time for us to extend a helping hand to them, and let them know that everything will turn out okay. Let’s surprise the Nevins family with a GREAT Love Drop this month! Click here to make a 1-time payment, or give via check or credit card. Episode #2: Grow Babies, Grow! After spending weeks in the NICU, triplets Aaron, Jeffery and Aleana are getting bigger and healthier by the day :) Weighing in at a whopping 6 pounds each (huge in preemie terms) these little dolls are almost ready to come home and that’s going to be a big challenge for parents, Jeff and Becca. With four people already busting the seams on their 900 sq foot trailer home, when the triplets arrive in a few weeks, it’s really going to be a tight fit. Jeff is already looking forward to his Thanksgiving turkey and Becca will be thankful to have her babies home but right now they just wonder how they’re going to make it work. We know we can help! These babies are going to need a lot and babies are super fun to shop for. Their stuff is so darn cute. Aaron, Jeffery and Aleana have already fought so hard. Let’s make sure they have everything they need when they finally come home! In Which We Drop Love on The Triplets! Talk about a baby success! Y’all raised over $2,000 in cash and gifts, and we were able to surprise Jeff & Becca with a VAN FULL of baby supplies! And it only took us 6 hours to go out and buy, haha… (you’ll see our Babies “R” Us spree and antics in the video ;)). Overall we were able to show up with over 2,300 diapers, 2,700 baby wipes, 480 servings of formula, 3 high chairs, a large crib, TONS of toys and clothes, and enough detergent for over 740 loads of laundry. It was quite the celebration, let me tell you. And it just goes to show again how IMPACTFUL each and every one of your single acts of kindness can have when joined together for a specific mission. In 30 days you affected 3 of the most beautiful babies around, and the whole family will be forever grateful. Way to go, team! TWO complete Date nights! Which consists of two fancy dinners, followed by tickets to the movies and FREE baby sitting by a close friend of theirs. Gotta make sure the parents have breaks! $75 worth of Babies “R” Us gift cards: Thanks again Trinnie and Jessica! A Nintendo Wii :) For the whole family to play and spend some fun times together. A gift bag of beauty goodness from Sarah – Thanks so much for driving all the way over to celebrate with everyone! 6 months of coaching services from JRRSEHopeCoaching.com – Solutions for midlife parents, troubled teens, single moms & career challenges. And a photo book from GroupStory to capture the entire Drop’s celebrations. WAY TO GO guys!! These babies are gonna be sooooooo taken care of for quite a while – give your selves some pats on the back :) So amazing how everyone’s efforts combined can create such a larger impact in such a small amount of time we have every month. Keep up the great work!! *Special thanks to Casey Mullins for her awesome Photography skills!